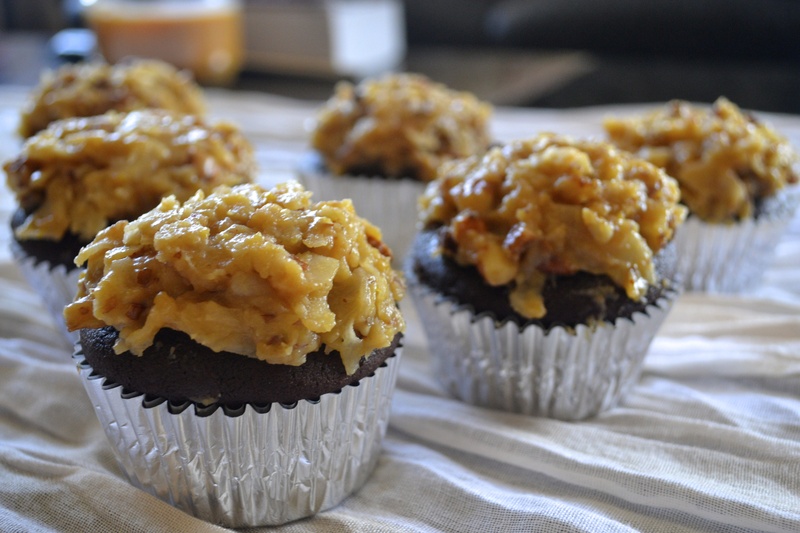 For breakfast this morning, I offered my roommate a German chocolate cupcake. When she initially declined, I told her that it covers all food groups–you have your carbs, proteins, and even nuts! It’s like a Cliff bar but even tastier. 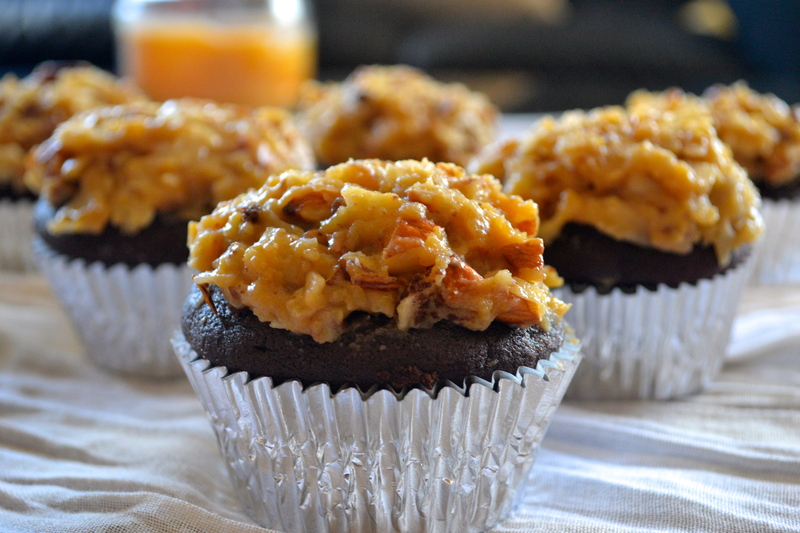 Who knew cupcakes could be such a hearty breakfast food? Anyway, onto the actual cupcake. I loved the recipe that I adapted from FoodNetwork. The chocolate cake with the sour cream made the cake so moist and fluffy. Then the large amount of cocoa powder and coffee made the cake more of a dark chocolate cake, which complemented the frosting very nicely. The frosting itself was so great. While making it, I was a bit worried that it wouldn’t hold together, since it was so liquid-y and looked a bit curdled when it was simmering on the stove. I ended up keeping the mixture on the stove for about twenty minutes. You cannot cut down this process, otherwise the mixture will not hold! I was also worried that I didn’t have the proper ingredients. Whole Foods is a great supermarket for organic, non-GMO (things-that-don’t-involve-fine-print-etc.-etc.-type-of-foods) ingredients, but sometimes you just want normal shredded sweetened coconut. I ended getting unsweetened organic coconut flakes, which, I might add, taste disgusting if you eat them plain. I chopped them up before adding them to the mixture, and I even added about one cup of confectioner’s sugar to make (a): make a healthy product unhealthy, but more importantly (b): to make the mixture sticky. Overall, I really enjoyed this recipe. The smooth chocolate cake complemented the crunchy frosting nicely. As I did have a bit extra frosting near the end, I added a surprise in the middle of the cakes. Hint: the surprise is more frosting! 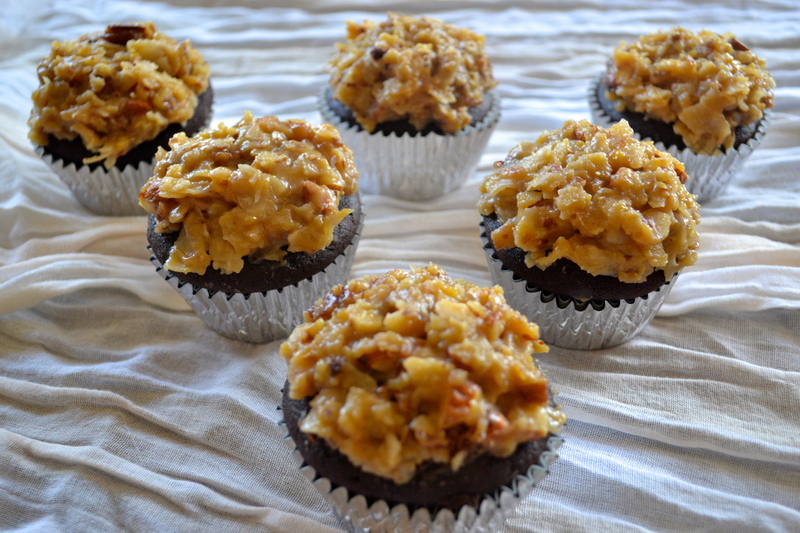 I highly recommend German chocolate cupcake recipe! 1. In a small bowl, whisk together the flour, cocoa powder, baking soda, baking powder, and salt. 2. In a medium bowl, combine the buttermilk, sour cream, vanilla extract, and coffee. 3. In a large bowl, cream the butter and sugar until light and fluffy. 4. Add the eggs to the mixture one at a time. 5. Add the flour mixture and the liquids alternately, beating well after each addition. 6. Fill 24 cupcake liners about 2/3 full. 7. Bake at 350F for about 18 minutes or until a toothpick comes out clean. 4. 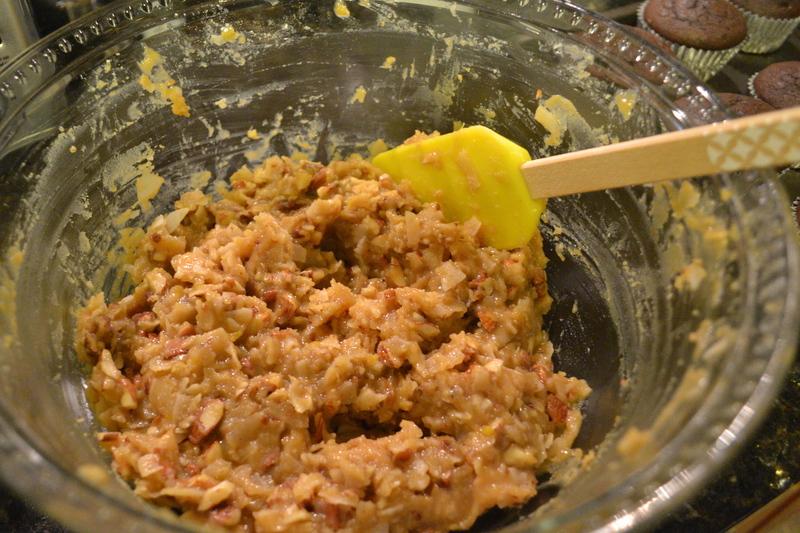 Take off the heat, and fold in the vanilla extract, almond extract, coconut, pecans, salt, and confectioner’s sugar. 5. 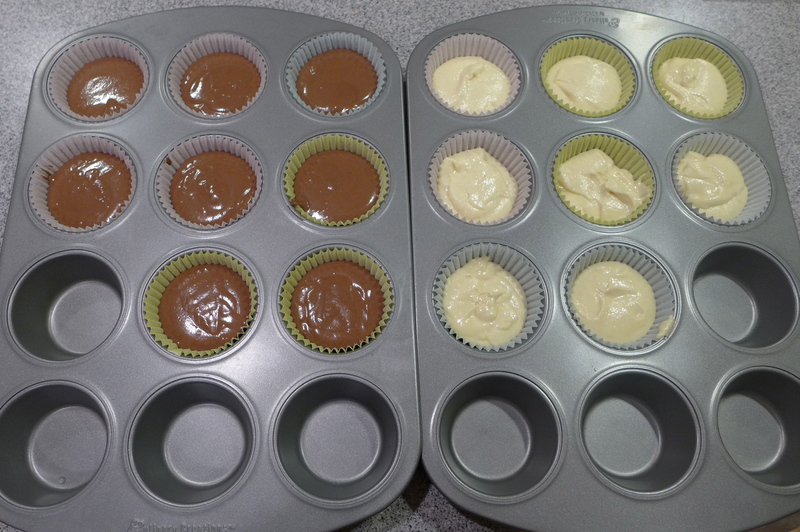 Allow the mixture to cool, frost the cupcakes using a spoon or knife then enjoy! Green tea cupcakes really hit home for me. 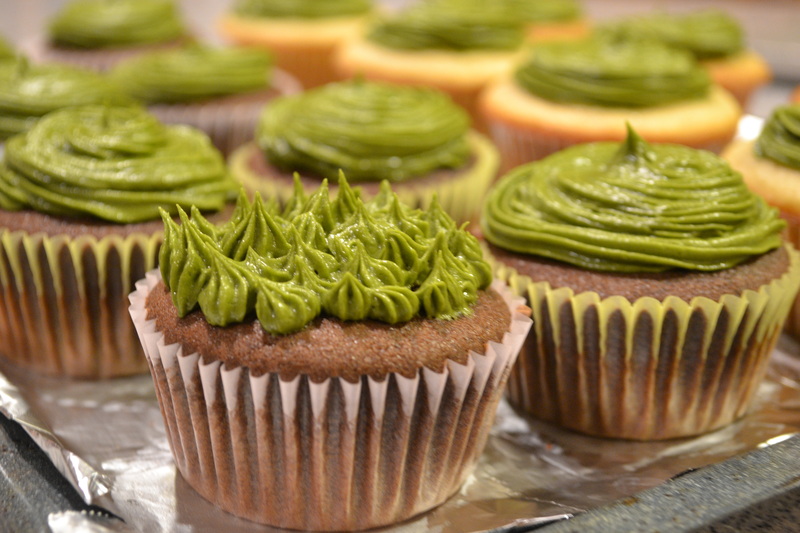 Not only do I love anything green tea because it is good for the healt, green tea cupcakes were the first cupcakes that I ever made from scratch in March 2012. It’s really something to compare photos from then to now and to see how much I have improved. This time when I made them, I had the company of my cousin Anna and used some stolen borrowed matcha powder from my sister. 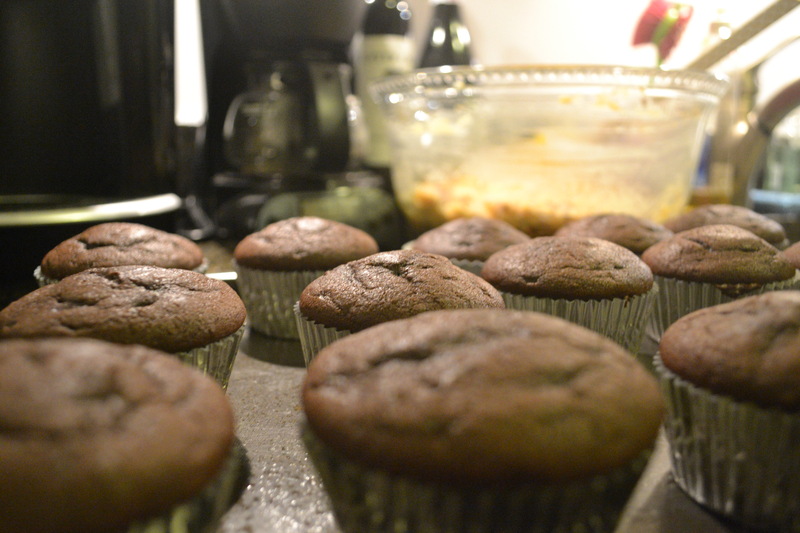 Baking alone, for me, is usually a stress-reducing activity (until I realize I have a dozen cupcakes for myself–then it becomes stress-inducing! ), but it’s also great to bake with family or with friends. Matcha powder, as expensive as it is, is such a beautiful powder. 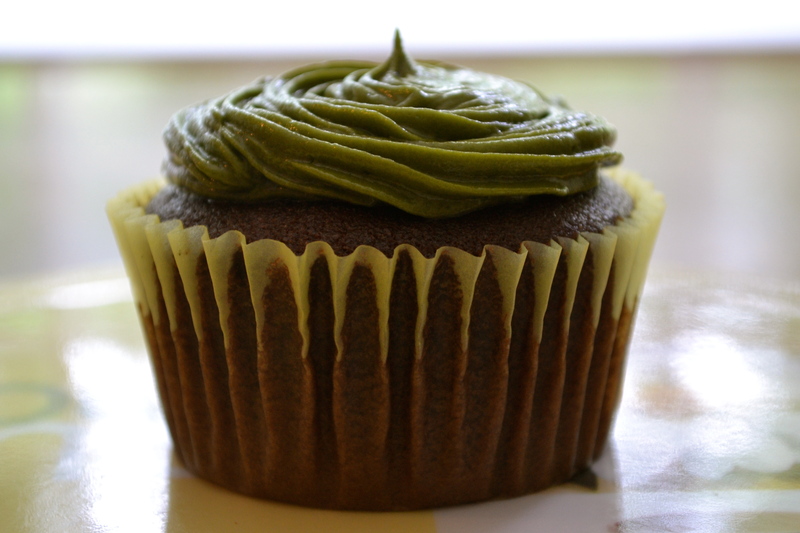 It is so fragrant and has a beautiful rich green color–no food coloring was used in the frosting! With the green color, it is also fun to make grass and other patterns. 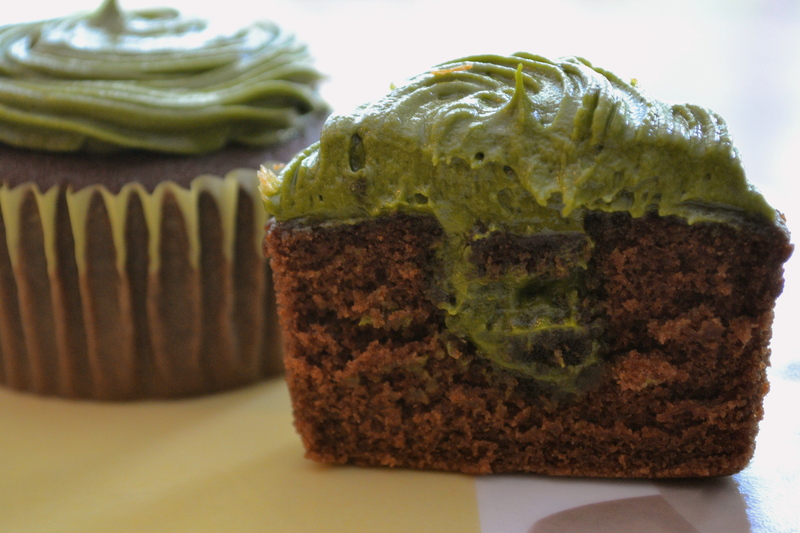 We made both chocolate and vanilla cupcakes with green tea frosting with a surprise inside. I’m usually partial to desserts with chocolate, but both the vanilla and chocolate cupcakes were delicious, so I’d recommend you make both! 1. In a small bowl, whisk together the flour, baking powder, baking soda, and salt. 2. In a medium bowl, combine the buttermilk and vanilla extract. 6. Fill 16 cupcake liners about 2/3 full. 7. Bake at 325F for about 20 minutes or until a toothpick comes out clean. 1. Whip the butter until it is light and fluffy. 2. Mix in the liquids, matcha powder, and confectioner’s sugar until it is at a desired consistency.